I’ve payed a variety of naval rules over the years, and for this game I choose General Quarters 3 as it is new to me having only played once before (that was River Plate) and I wanted to give it a proper spin. Setting up the fleet rosters was straight forward enough, and although some of the more obscure classes of ship were not listed in the main rule set it was easy enough to make up their cards. The game got off to a flying start. Ships move by division so plotting was quick. Also for any long range gunnery I rolled the dice first only checking the gunnery charts if I rolled any of the magic numbers. The allied fleet altered course to due north to try and keep clear of the Japanese heavy cruisers while the RN destroyers laid out a smoke screen. However the INJ have the advantage of aerial spotters and even through the smoke 8” shells were straddling the flagship. A well aimed shot took out De Ruyter’s A mount and ignited the magazine, only by flooding the forward section was the ship saved. The Houston, the only radar equipped ships, was able to cut through their own sreen and begin returning the compliements, hitting the Nachi amidships and setting alight the aviation fuel. While I was enjoying the cruiser exchange, I complete neglected the opposing destroyer columns. I see now why steaming at 32 knots is not necessary a good thing. Both sides closed far too rapidly, the IJN completely fluffed their attack pattern were not able to launch their deadly long lance before running into a series of collision with the allied destroyers. The Korteaner’s bow was first sheared off by the Jintsu before her sister the Korteaner collided astern, sending the lead dutch destroyer to the bottom. 5” shells where whizzing about as both columns in a panicked state took evasive action. A lucky shot from the Electra resulted in an explosion onboard the Amatsukaze which broke in two and sank. 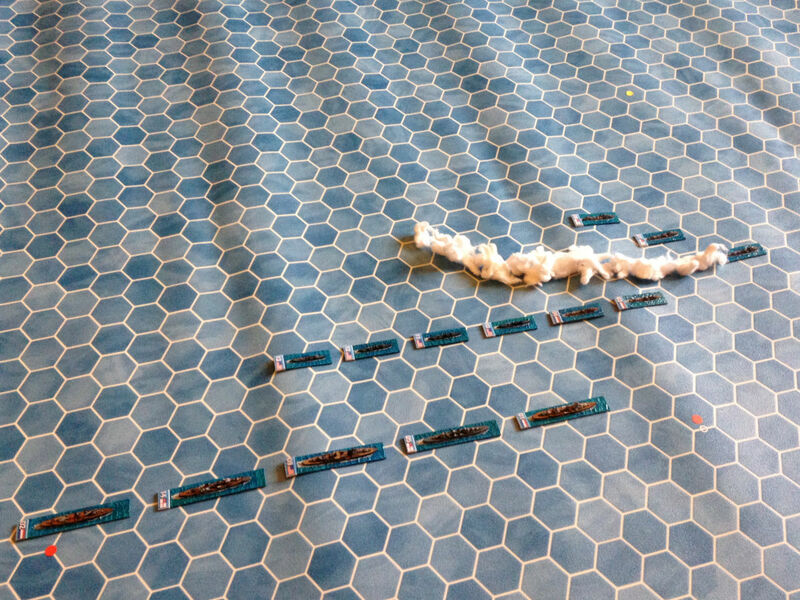 By now the Imperial heavy cruisers had cleared the obfuscating line if smoke and drew a clear line on the enemy column. Allied air defence had managed to down one spotter plane but three remain aloft and splashes from well time 8” shells were closely bracketing both the Houston and the De Ruyter. 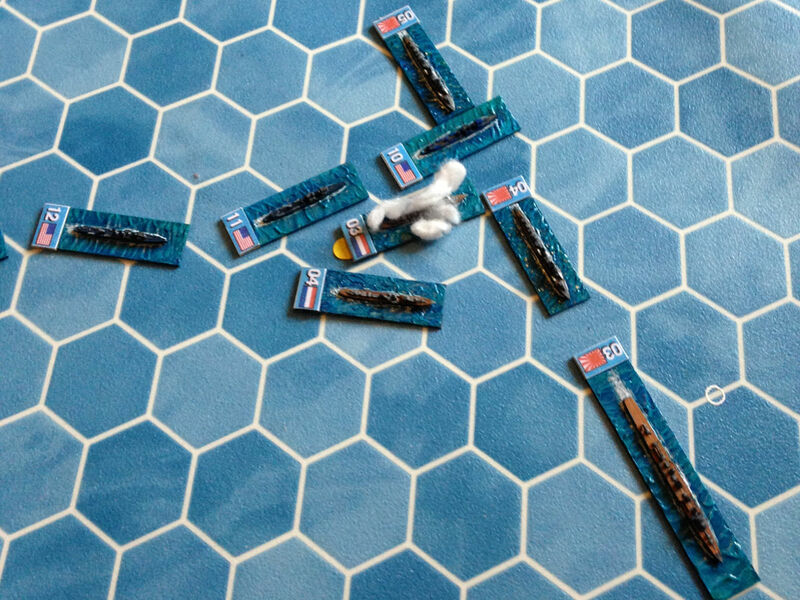 A Within minutes the US heavy cruiser had lost all primary weapons and the De Ruyther was low on the water, they did manage to bloody their opponents nose as the Hagaru lost her B turret by a superbly targeted attack form the Java. With the allied destroyer column in disarray with most having sustained some damage and the US heavy hitter effectively out of the fight I called it a day. 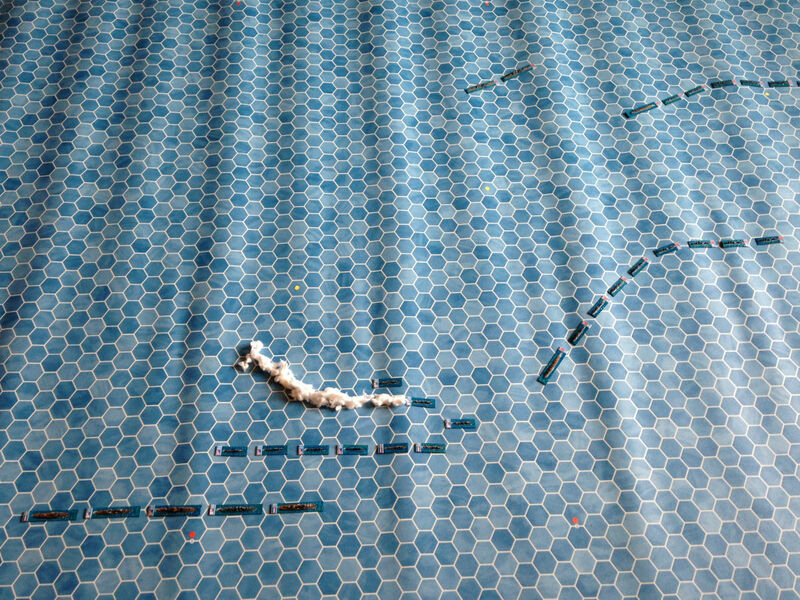 Disappointed that not a single torpedo was launched I realised that this was down to woeful seamanship on my part by not paying attention to their movements. I was otherwise happy with the outcome of the gun combat and really look forward to the next attempt. 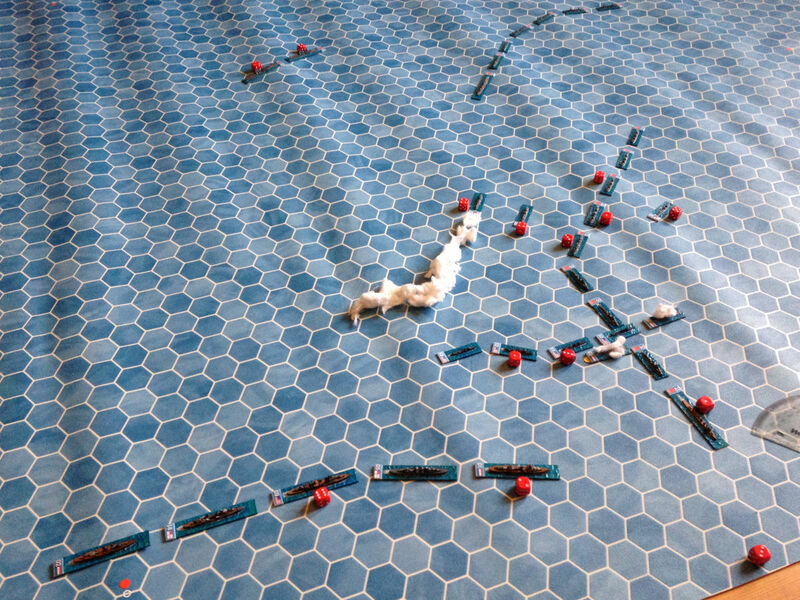 Note that GQ3 does not use hexes, that was the only mat I had that was big enough for the deployments.